Weighty Matters: Convicts and soldiers to be force fed Omega 3s? As usual there are lots of news stories about Omega 3s (including last week's that some omega 3 supplements may contain high levels of PCBs) but two really caught my eye. The first detailed a hypothetical plan to force feed convicts omega 3 supplements as a means to reduce violent and aggressive episodes. That plan is being born out of the results of a recent study titled, "Effects of nutritional supplements on aggression, rule-breaking, and psychopathology among young adult prisoners". 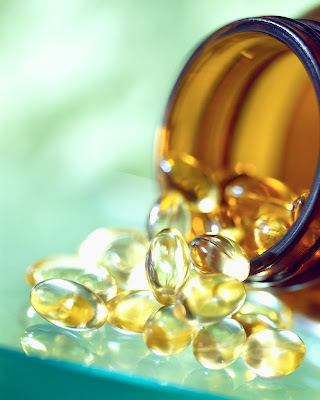 The study tracked 221 adult prisoners and randomized them to receive either placebo or a nutritional supplement containing 25 vitamins and minerals along with omega-3 and omega-6 fatty acids. Staff then tracked aggressive and rule breaking behaviours. The authors found that the supplemented group saw their aggressive and rule breaking behaviours decrease by 34% versus a 14% increase in the control group. Sounds really impressive until you see the absolute numbers whereby we're talking about 11 incidents per 1,000 prison days in the supplemented group vs. 9.7 incidents per 1,000 prison days in the control. I also have to question the blinding in this study in that fish oil capsules are absolutely noticeable, even enteric coated ones, when you burp. Oh, and no, this wasn't truly an omega 3 study given the supplements had many other vitamins and minerals in them. The second story I mentioned? Apparently the American Department of Defense is considering force feeding the US military omega-3 supplements as a means to, "enhance stress resilience, wellness, and military performance". Now I'm not sure on which study they're basing their recommendations but hope if they do use them on the military that it doesn't hinder their troops' combat skills by rendering those fighting men and women less violent and aggressive.